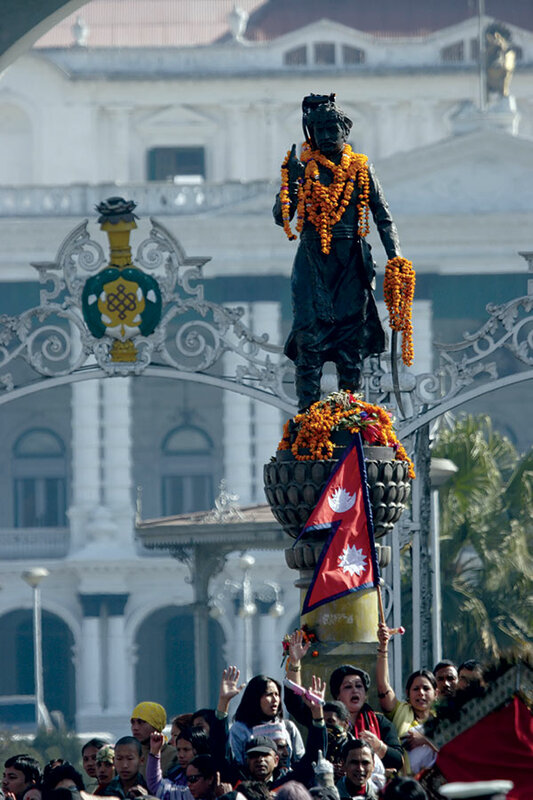 One of the latest chapters in Nepal’s history is being written outside the country’s borders. 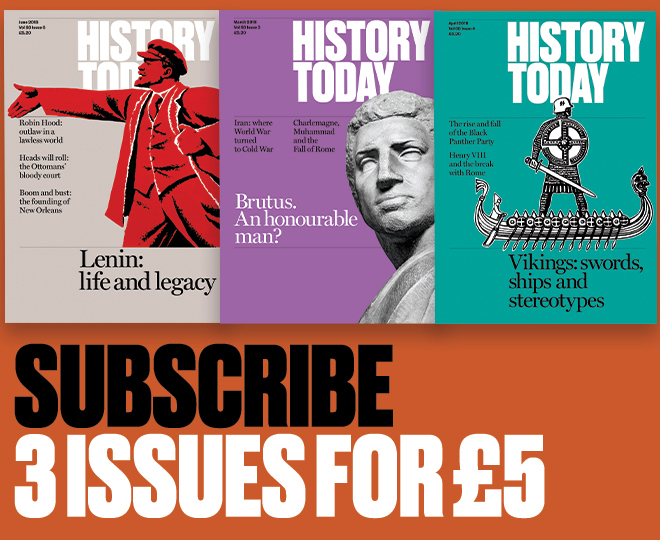 Those borders – established in 1816 after a war with the British – were off-limits to foreigners for much of the country’s modern history, as Nepal underwent self-imposed isolation until the 1950s (a feat helped by its Himalayan geography). This is no longer the case. 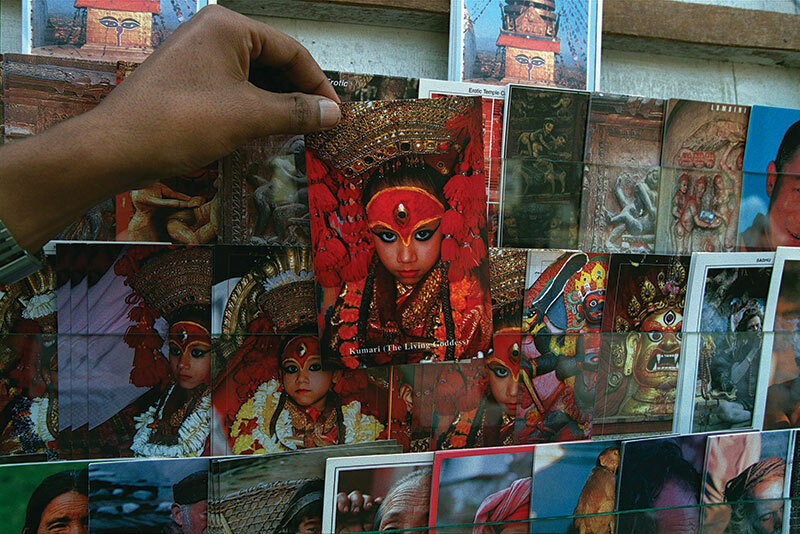 The contemporary Nepalese artist Hit Man Gurung’s series ‘I Have to Feed Myself, My Family and My Country ...’ – a work from which concludes this picture essay – confronts the large numbers of Nepalese travelling as economic migrants to affluent parts of Asia and the Middle East, where conditions have been exposed as tantamount to modern slavery. Nepal is one of the world’s poorest countries. Swayambhunath Stupa, Kathmandu, 1977. Siddhārtha Gautama – better known as the Buddha and founder of the eponymous religion – was born in Lumbini, possibly in 623 BC. Buddhism spread throughout the Indian subcontinent with the Maurya Empire (322-187 BC), especially during the rule of Ashokra (c.268-232 BC). Hinduism eclipsed Buddhism as the predominant religion in Nepal after the arrival of the Licchavis in the early centuries AD. 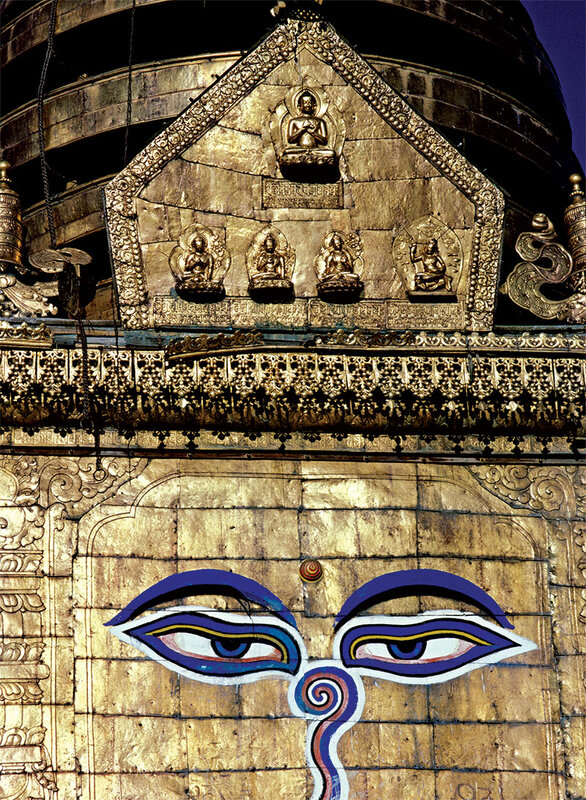 Here, the Buddha’s eyes and eyebrows adorn a famous stupa revered by both Buddhists and Hindus. 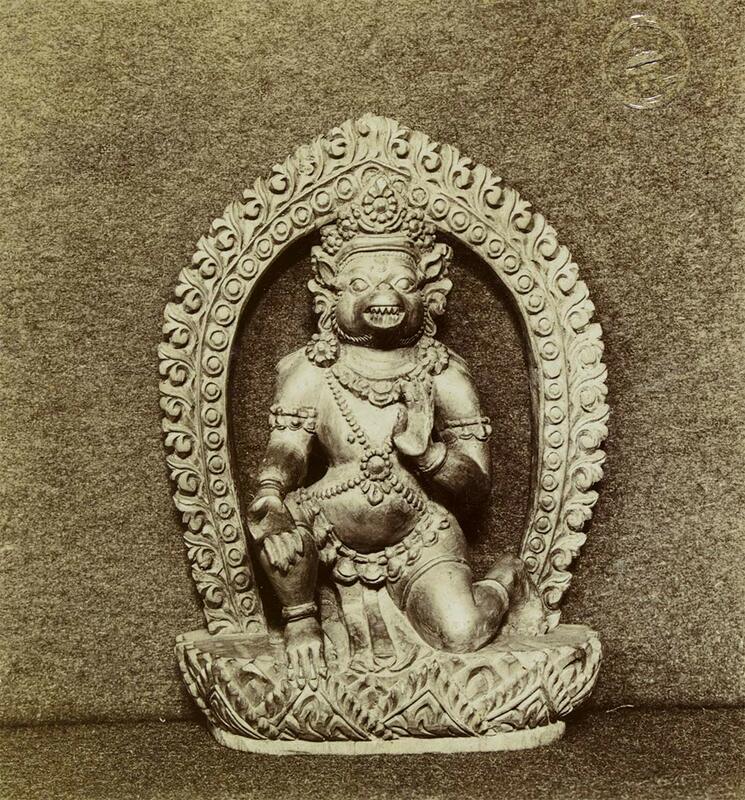 Carved wooden figure of Hanuman, the monkey ally of Rama. In 1989 the Nepalese art historian Lain Singh Bangdel published Stolen Images of Nepal. 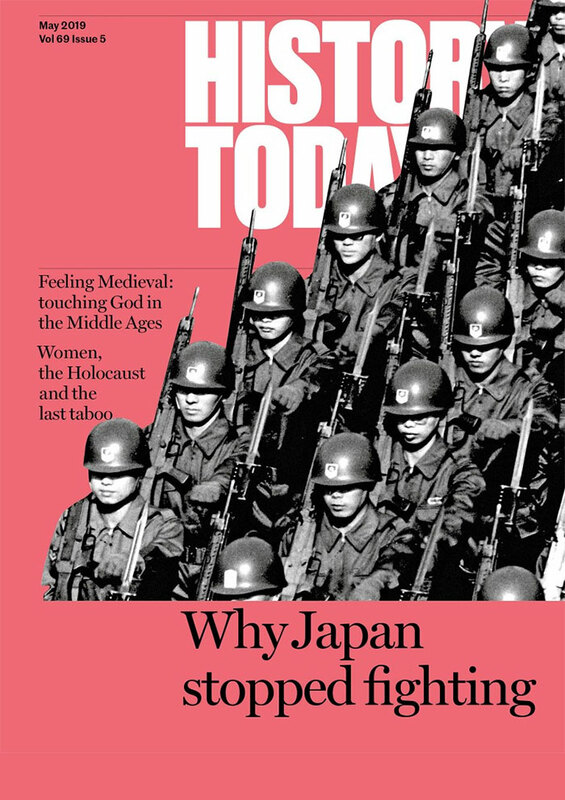 For centuries, the country’s geographical isolation kept its rich history of religious art safe. When Nepal ‘opened to the world’ in the 1950s, visitors arriving in Kathmandu encountered ‘an enormous open museum where thousands of icons of gods and goddesses … were found almost everywhere’. These soon began to disappear, surfacing in private collections in the West. 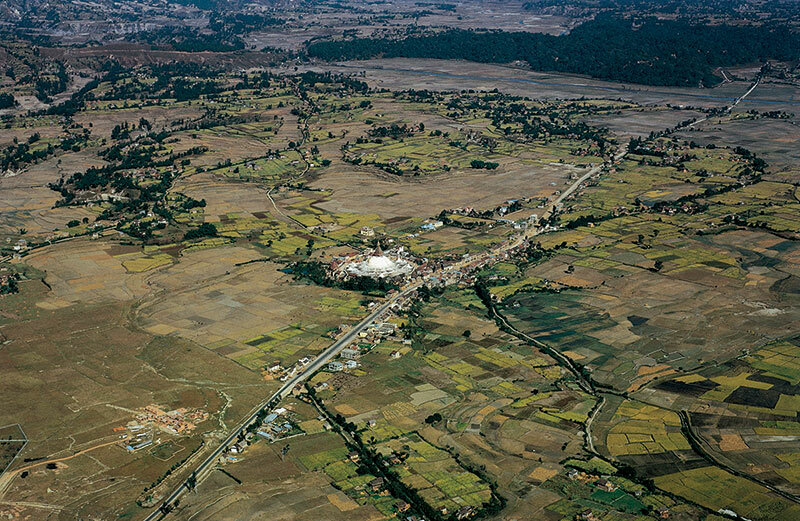 The Kathmandu Valley has long been a centre of civilisation in Nepal. With the Himalayan mountains to the north and the terai – a marshy, lowland, subtropical area – to the south, Kathmandu was an important entrepôt between India and Tibet. Merchants wishing to cross Nepal would wait until the cold season to traverse the terai (due to the presence of malaria) and then wait for warmer weather to face the northern mountain passes, necessitating stopovers in Kathmandu. Seen here is Boudhanath stupa, located north-east of Kathmandu on an ancient trade route from Tibet. Postcards of the Royal Kumari, Anita Shakya, September 1999. Worship of the Kumari – or ‘Living Godess’ – is a Newar tradition that is over a thousand years old. Pre-pubescent girls from a specific Buddhist caste are worshipped by Buddhists and Hindus across Nepal, though the Royal Kumari resides in a bespoke palace in Kathmandu. Faced with a Gorka invasion in 1757, the Malla king Jaya Prakasha Mall built a grand palace for the Kumari in an attempt to protect Kathmandu. It did not work; the city fell to Prithivi Narayan Shah, who was blessed by the Kumari on his entry. In 2008 Nepal’s Supreme Court ruled that Kumaris should receive an education, which they were previously denied. 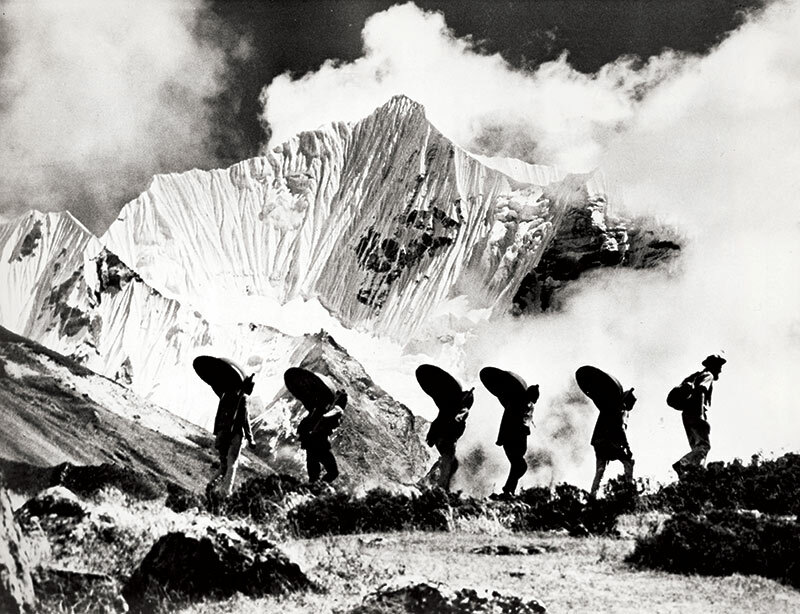 Toni Hagen leads a surveying expedition near the Ganja La pass, 1958. Nepal is one of two Himalayan states located almost completely within the mountain range (the other is Bhutan). This helped the country’s self-imposed isolation; it was closed to foreigners until 1951, meaning that the British Mount Everest expedition of 1924 had to approach the mountain from its north face in Tibet. Pictured here, the Swiss geologist Toni Hagen was one of the first foreigners to explore Nepal when, in 1950, he was employed by its government to do so. He spent nine years in the country, covering 14,000 miles in the process. 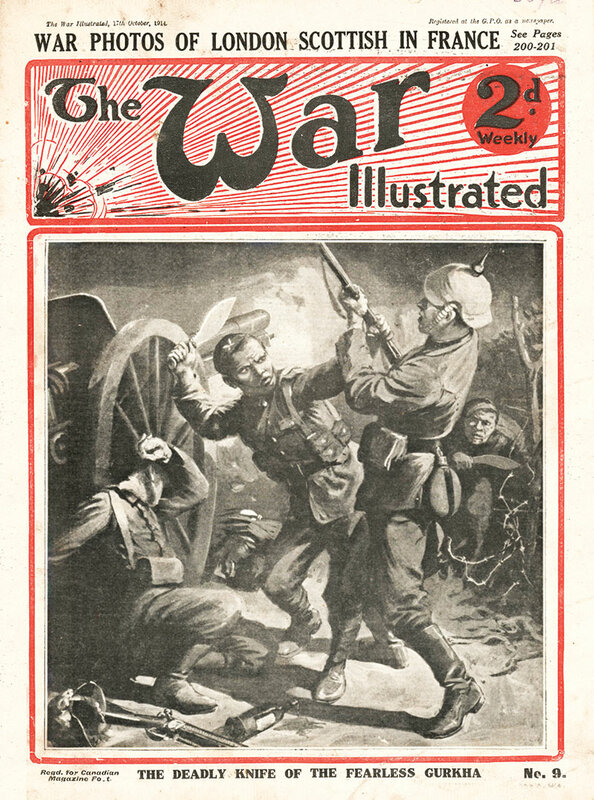 Issue of The War Illustrated showing Gurkhas in action, 1914. Taking power around 1200, the Malla controlled the Kathmandu Valley, which was split, in 1482, between the rival kingdoms of Kathmandu, Patan and Bhaktapur. 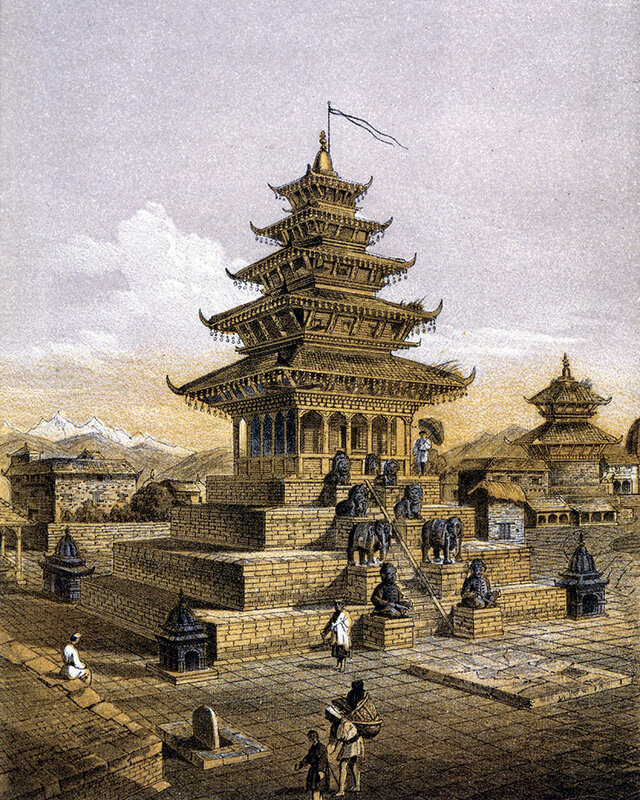 The Malla era was significant for architecture, with pagoda design pioneered by Araniko (1245-1306) spreading to China and elsewhere. Built in 1702 in Bhaktapur, the Nyatapola Temple is one of the country’s tallest pagodas and still stands today. Nyatapola temple from History of Nepal by Singh & Gunanand, 1877.
borders and entailing a ‘humiliating’ loss of territory. Impressed with their adversaries, the British recruited Gurkha soldiers into the Indian army. Statue of Prithvi Narayan Shah, Kathmandu. Prithvi Narayan Shah is the Gorkha king who, by 1769, had united Nepal, founding the Shah dynasty, which ruled until 2008. Shah described his kingdom as a ‘yam between two boulders’, but embarked upon wars of expansion regardless. Statues such as the one seen here were pulled down during communist rule in 2008, but in January 2018 his birthday was celebrated as National Unity Day for the first time in 11 years. 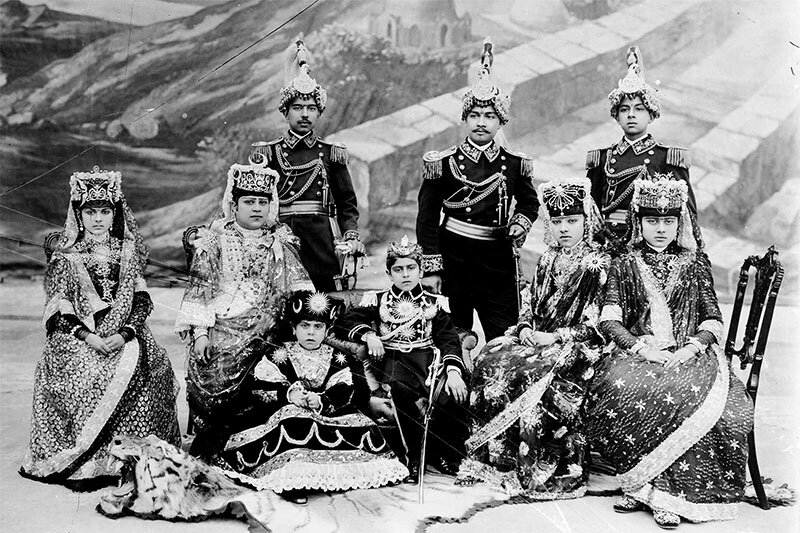 King Tribhuvan (seated, centre) with the royal family. Dirgha Man Chitrakar, 1920s. In 1846, Jung Bahadur seized political power during the Kot Massacre, assuming the murdered prime minister’s role and establishing a family autocracy – with the assumed name ‘Rana’ – that controlled Nepal until 1951. Though not deposed, the Shah (pictured here) became powerless under successive Rana prime ministers. Rana Nepal saw some modernisation, but also tyranny and isolation. Photos by the court photographer Dirga Man Chitrakar (1877-1951) provide a rare glimpse of the closed country. Defaced portraits of communist leaders in Thawang, June 2005. In 1996 a Maoist branch of the Nepalese Communist Party launched the ‘People’s War’. A guerrilla conflict was fought between Maoist insurgents and the government from 1996 to 2006, when a peace accord stripped King Gyanendra – the world’s last Hindu monarch – of political rights and nationalised royal property. The Maoists entered mainstream politics and the monarchy was abolished in 2008. 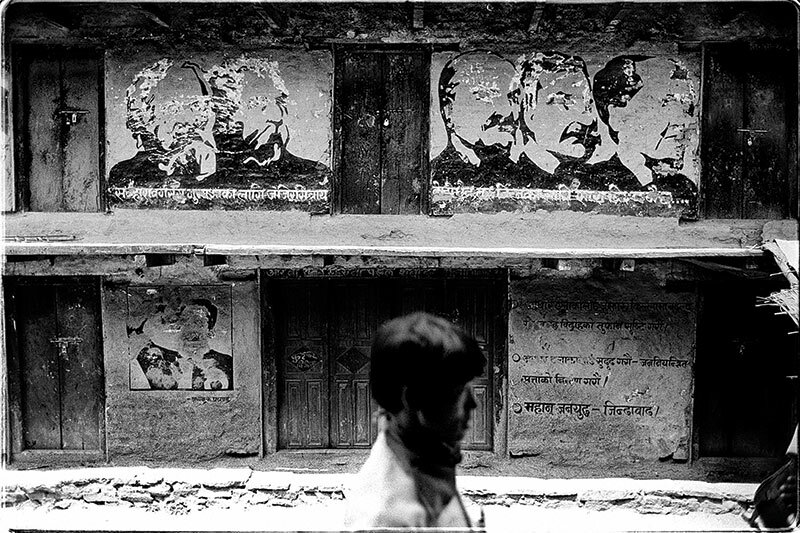 The portraits seen here in Thawang (a Maoist stronghold) have been defaced during a Royal Nepalese Army raid. ‘I Have to Feed Myself, My Family and My Country ...’, Hit Man Gurung, 2013. Artist Hit Man Gurung’s collage highlights Nepal’s economic dependence on emigration and foreign jobs. 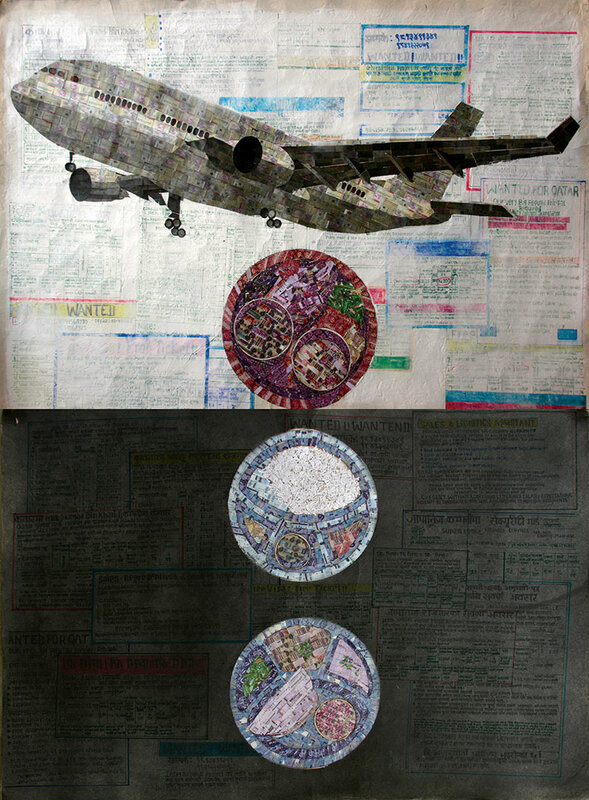 The aeroplane is made of Nepalese passport prints and the three plates represent Nepal’s regional cuisine, made by currency from the Middle East and Malaysia. In 2014 the Guardian reported that Nepalese migrants building World Cup stadiums in Qatar were dying at a rate of one every two days. Remittances sent from abroad make up a quarter of Nepal’s GDP.